Bend, OR Real Estate Explore Bend, Oregon Homes For Sale and Local Information! Bend is a mecca for outdoor enthusiasts, beer lovers, entrepreneurs, and those who enjoy the high desert climate; warm days and chilly nights. With all that Central Oregon has to offer, this vibrant community is an excellent fit for both individuals and family. View Homes For Sale in Bend, Oregon. Entrepreneurs will find that Bend is one of the best cities in the United States in which to start a business. With its close proximity to lakes and rivers, along with more than 300 days of sunshine each year, Central Oregon is perfect for businesses that require natural resources or significant time spent outdoors. Bend, OR is also the ideal spot for anyone who enjoys biking, hiking and other physical activities. In fact, Bend, Oregon is home to more than 50 miles of developed paths, all of which are linked by the Urban Trails System. In addition, Bend is often referred to as BeerTown USA and DogTown USA. When you spend some time in town, you’ll see why both nicknames apply! If you’re looking for beer, rec, and tech, Bend is the place for you. Bend, OR offers a unique blend of cosmopolitan sophistication and outdoor recreation capable of keeping even the most restless individuals entertained. The people in Bend are always moving, and the atmosphere is upbeat and exciting. Bend is best known for its variety of outdoor attractions, including hiking, biking, rock climbing, rafting, skiing and so much more. Bend also hosts plenty of family-friendly activities, including concerts, festivals, mini-golf and go-carts. Bend is home to top notch schools, from Elementary through High School level. View all schools in the Bend LaPine School District here, or view map below. Bend, OR is also home to Central Oregon Community College, the Cascades campus of Oregon State University and the Central campus of Eastern Oregon University. Bend, Oregon boasts gorgeous landscape, sunny weather and plenty of outdoor and indoor diversions. 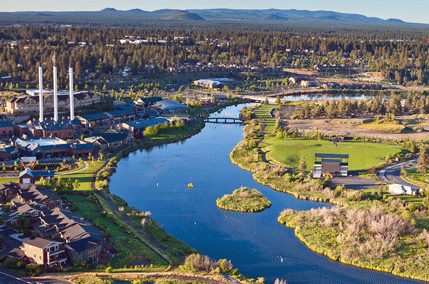 Whether you’re living on your own, starting a family or ready to retire, there’s something for you in Bend. Make the move to this vibrant city and take advantage of all it has to offer.